:: Sponsored by: Kingston Gallery, Francesca Anderson Fine Art, North Bennet Street School, MFA Lead Artist - Community Arts Initiative Artist Project, Maynard Cultural Council, Vermont College of Fine Arts, AS220, Worcester Art Museum, Iris and B. Gerald Cantor Gallery, and the Artscope Tablet Edition. This week we're presenting Society of Arts + Crafts, Newport Art Museum, and Darwin's Ltd, each offering surprising and unique exhibitions that keep the viewer on their toes. There are many other interesting and exciting events and exhibitions coming up for those who want more. We're supporting The Museum of Russian Icons's exhibition Migration + Memory, which you can visit from now until January 28, 2018. The Society of Arts + Crafts is gearing up for CraftBoston, happening on December 15 - 17 at the Hynes Convention Center. Tickets are still on sale, and you can get a discount on yours if you use the online code "SCOPE." 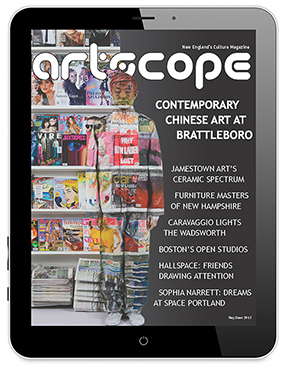 There's still time to advertise in the January/February 2018 issue of Artscope. Contact us at advertise@artscopemagazine.com or (617) 639-5771 to inquire. Currently showing until January 6, 2018 at the Society of Arts + Crafts is "Fantasy Architectures: Sculptural Boxes," an exhibition featuring the sculptures of artist Jay Rogers. Rogers has been making art for over thirty years, and his current series is inspired by the likes of M.C. Escher and Giovanni-Battista Piranesi. Each sculpture differs in size, scope, and medium, but the one thing they seem to have in common is the puzzling nature of their construction. It's difficult to see where a piece begins or ends, and the strange optical illusions in each piece could hold one's attention for hours. The sculpture "Escher Series #3" takes clear inspiration from Escher with its tiny staircases to nowhere and walls and floors that run into each other. But there's a basis to the madness: The sculpture has three façades that can be slid apart, allowing one to lift the top of the sculpture and expose a hidden compartment. Rogers describes the piece as "hard to explain, harder to visualize, and a nightmare to make!" There may be no better words to describe the works in "Fantasy Architectures:" Improbable, perplexing, but above all, captivating. The Society of Arts + Crafts is located at 100 Pier 4, Suite 200, in Boston, Massachusetts and is open Tuesday - Saturday 10:00am - 6:00pm and Thursday 10:00am - 9:00pm. For more information, please visit www.societyofcrafts.org/exhibitions/current-exhibition/fantasy-architectures. Sponsored by: Kingston Gallery, Francesca Anderson Fine Art, North Bennet Street School, MFA Lead Artist - Community Arts Initiative Artist Project, Maynard Cultural Council, Vermont College of Fine Arts, AS220, Worcester Art Museum, Iris and B. Gerald Cantor Gallery, and the Artscope Tablet Edition. 46 artists are exhibiting their small works no larger than 12" x 12" on both floors of the gallery. Over 200 paintings and prints can be seen in the gallery's Signature Show. Don't give Another Cashmere Sweater!! Give a Print or Painting $ 200 - $ 800! An exciting exhibition of work by professional, amateur, and student bookbinders from all over the world. This special showing at NBSS will feature all 28 prizewinners from the Designer Bookbinders Competition, along with 8 additional bookbinders from the United States. The Museum of Fine Arts, Boston serves a wide variety of people-from school children to adults-through direct encounters with works of art. In addition to housing renowned collections, the Museum also offers numerous exhibitions and opportunities for learning and community engagement. The Artist Project is a collaboration between the MFA and ten after-school community organizations in the Boston area. Each year a new experienced artist with a passion for community arts is selected to plan and lead a project with children between the ages of six and twelve. The lead artist guides the children and helps them create a collaborative work of art inspired by the Museum's encyclopedic collection. The completed project is exhibited in the Edward H. Linde Gallery in the Linde Family Wing for Contemporary Art at the MFA. A stipend of $22,000 and a materials budget is provided to the selected artist. Please visit our webpage for more information and to apply. Christopher W. Benson, The Quilter's Daughter, 2012-14, oil on linen, 48 x 96 inches. Courtesy of the Artist and Jessica Hagen Gallery, Newport, RI. Newport Art Museum is showing "Pictures & Windows: The Paintings of Christopher W. Benson from 1975 to 2017" until December 31. The exhibition reveals the development of Benson's style over the forty years he's been a painter. After graduating from Rhode Island School of Design, he traveled to various cities across America, incorporating the things he saw and the people he met into his works. His influences are many, from experiences he's had to other artists he's enjoyed. All these inspirations have combined to create a style unique to Benson; recognizable elements forming something completely new. He's painted land- and streetscapes based on numerous cities utilizing various genres, from realism to abstraction. The one commonality that ties his works together, from the earliest pieces to the most recent, is perhaps the feeling: Each work is evocative of America and its culture at the most intimate level. The scenes are familiar in a way that's hard to articulate, like a less dramatic but more down to earth version of Norman Rockwell's works, showcasing snapshots of American life that anyone can relate to. In a time where Americans are more divided than ever, "Pictures & Windows" provides a kind reminder of the ways in which we remain the same. Newport Art Museum is located at 76 Bellevue Avenue in Newport, Rhode Island and is open Tuesday - Saturday 10:00am - 4:00pm and Sunday 12:00pm - 4:00pm. For more information, please visit www.newportartmuseum.org/Exhibitions/Now-on-View/Pictures-Windows. Darwin's Ltd is featuring "Exhibition of Digital Dream Art" until January 15, 2018. This exhibit is produced by Cambridge Art Association (CAA) as part of their Satellite Spaces program. CAA exhibits art and offers educational opportunities to facilitate communication between artists, art enthusiasts, and collectors. "Exhibition of Digital Dream Art" showcases the artwork of Deirdre Barrett, a Harvard professor, psychologist, writer, and artist. Barrett is primarily known for her research and studies of dreams, on which she has published several books. One has to wonder: What does a person who studies dreams for a living dream about themselves? Thanks to Barrett's recent foray into art, this question has an answer. Barrett bases her pieces off her own dreams, and creates them by digitally manipulating images and printing them on aluminum. The works are psychedelic and dazzling, utilizing a rainbow of color with emphasis on emerald greens and deep navy blues. The longer one looks at a piece, the more they notice: The bodies of animals meeting in the middle, the faces that spring up in the environment, the eyes in places where eyes aren't meant to be. As Barrett explains, "My goal is for the viewer to experience a connection with the dream world...to connect with their own nocturnal realms from the vantage of the waking self." Indeed, the dreamscape depicted in her work is unique to herself yet startlingly familiar in how it blurs elements of fantasy and reality. If one has ever dreamed, they can find common ground in Barrett's work. Darwin's Ltd is located at 1629 Cambridge Street in Cambridge, Massachusetts and is open Monday - Saturday 6:30am - 9:00pm and Sunday 7:00am - 9:00pm. For more information, please contact Deirdre Barrett at 617-828-8691 or at dbarrett@hms.harvard.edu. The MFA in Visual Art program at VCFA welcomes Tariku Shiferaw as our Artist-in-Residence this winter. Recent exhibitions include the 2017 Whitney Biennial and a solo exhibition, One of These BlackBoys, at Anthony Philip Fine Art in Brooklyn. Shiferaw will install an exhibition of his paintings that will be open to the public along with our student exhibitions, opening January 26 and closing February 1, 2018. For more information, contact Thatiana Oliveira at 802-828-8696 or thatiana.oliviera@vcfa.edu. A Worcester community of color is brought back to life in this exhibition of stunning portraits of people of African-American and Native American descent taken by itinerant photographer William Bullard from 1897 - 1917. Robert Beauchamp (1923-1995), Tucson, 1980, graphite, charcoal and pencil on paper, 35" x 23"
Robert Beauchamp (1923 - 1995) created a vast number of works on paper as well as paintings from the 1950s to early 1990s. Through the generosity of Beauchamp's widow, Nadine Valenti Beauchamp, the Iris and B. Gerald Cantor Art Gallery received a substantial gift of works on paper from his estate. The exhibition traces his long career from the early days in New York to his death in 1995, highlighting a vast array of inventive drawing techniques, a never ending deep engagement with the figure, along with imaginative combinations of personal symbols and narration.